Telangana and Andhra Pradesh are slowly cementing their place as the locations of choice for IT firms setting up offices in India. Indian IT companies already have a huge presence in Hyderabad with Infosys and TCS having their largest campus and training centres in Hyderabad respectively, while US MNCs Google, Amazon and Uber have announced plans of setting up large offices in Hyderabad. Now Microsoft has promised to set up a Centre of Excellence in Visakhapatnam, a major port city in the newly-formed state of Telangana. The company will also work with Telangana government’s startup incubator T-Hub. This was announced by Microsoft CEO Satya Nadella who’s on a private visit to Hyderabad. Speaking at an event at T-Hub, Nadella said that Microsoft’s goal and dream is to empower local entrepreneurs to solve last mile connectivity. “”There are three points to success – concept, capability, culture. Learn more from day one…chase after your concept or idea. Improve your capability to chase the idea…Curate the culture,” he told entrepreneurs. 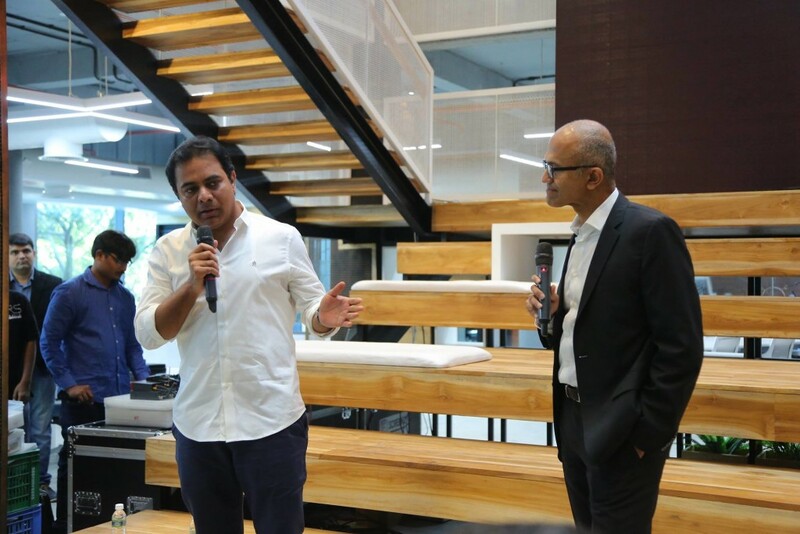 Telangana’s Information and Technology minister KT Rama Rao took him around the T-Hub and explained about various initiatives of the government. Earlier, Nadella had met Andhra Pradesh Chief Minister N Chandrababu Naidu.